Making the Tesla Roadster look even more ridiculous, the Oregon-made Brammo Enertia electric motorcycle just dropped its price from $11,995 to $7,995. How? They plan to sell 10,000 of them a year, that's how. Assuming you pay taxes, the Enertia can be even cheaper, qualifying for a 10% federal income tax credit that brings the price down to just $7,195. Best Buy will even finance one for you. I've ridden the Enertia and think it could be the ideal way to commute in and around cities. I managed 65mph up a hill and the tall, slim seat makes it an ideal platform from which to dodge cagers. 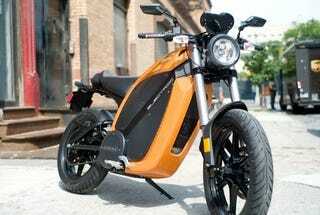 Unlike a lot of other electric bikes, this one's way overbuilt with a reliable brushless motor (road grime won't foul it like it will a brushed design) and fancy motorcycle components like 41mm Marzocchi forks. It makes 18 HP and 28 Lb-Ft of torque and the battery lasts about 42 miles on a full charge. Running costs, including fill ups, will amount to pocket change.